Every good home DIYer or trade professional needs a reliable socket set. If this is your first time buying a socket set, you may be confused with all the different options on the market, especially when the only discernible difference seems to be the number of sockets included in the set. Our team at ReviewLab has carefully considered a wide variety of socket sets to give you the best information possible about the choices available today. Check out our buying guide for in-depth explanations about the key considerations and price you should expect from the socket set you purchase. Read more about our methodology. The Stanley 92-839 is a socket set that features more torque capabilities, a wide number of socket choices and a lifetime warranty from the manufacturer. With these features, you can expect to use this socket set for a long time without any troubles. With both shallow and deep sockets, high-quality materials and a sturdy carrying case, the TEKTON 13101 is a great choice for home DIYers and professionals alike. If you’re looking for a flexible socket set, look no further than the TEKTON 13101. The EPAuto provides a good variety of pieces and attachments, along with a high-quality build. You also receive both metric and SAE sockets for more versatility across a variety of different applications. If you’re on a budget, this socket set makes for a great choice. The Crescent CSWS6 socket set is affordable, versatile and durable. These features make this a great choice for home DIYers and other hobbyists. With a lifetime warranty, among other features, this socket set is an overall reliable choice. The GearWrench 80300P is a reliable socket set that is tough and versatile. With a narrow swing arc, durable build and wide variety of individual pieces, you can work in almost any environment without a worry about accessibility. This tool is the perfect choice for anyone looking for a deep socket set. The TEKTON 4816 is a heavy-duty socket set that offers a shallow configuration for hard-to-reach areas. 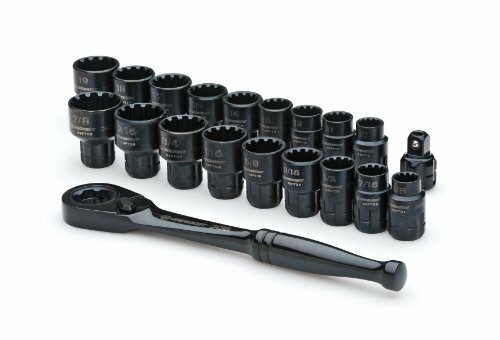 Featuring a sleek black design made from heavy-duty materials, this socket set is a great choice for professionals working with impact tools. The GearWrench 8946 is a reliable socket set that features a unique, pass-through configuration for each of its included sockets. This socket set performs well under pressure and for a variety of different projects with a high-quality build and a wide variety of included pieces. The Crescent CX6PT20 is a pass-through socket set with unique offerings that you’d be hard-pressed to find in other tools. Its one-of-a-kind socket grip allows you to work with several different types of fasteners, and its other features make this a worthy addition to the pass-through socket set lineup. The type of socket you choose for your toolset is important, especially depending on the types of bolts and applications you’ll be using the set for. There are three main types of socket types, and all are covered within this review. You can buy a deep socket set, a shallow socket set or a pass-through socket set. Each of these has their own pros and cons, mostly based on how easily you can access the bolt you are trying to remove or insert. Deep socket sets have a farther reach; shallow socket sets work well in tight spaces; and pass-through socket sets have an even farther reach than deep socket sets. Many sets include a variety of all of these socket types, however, there are sets on the market that are dedicated to one single type of socket. Most socket sets are available in three different drive sizes: 1/4-inch, 3/8-inch and 1/2-inch. This drive size measures the width of the individual sockets within the set. Smaller drive sizes are perfect for smaller applications like home DIY projects, while large driver sizes work well with larger applications like automotive work. It’s also a good idea to have a variety of drive sizes in your home socket set, so you don’t have to worry about not having a large enough socket in a time of emergency. The point of the socket is the part that fits over the actual head of the bolt. Most sockets are either six- or 12-pointed. Six-pointed sockets sit flush against every side of the bolt, while 12-pointed sockets feature a more circular configuration. Both point types can remove bolts and other threaded hardware, but each gives a different benefit. Since six-pointed sockets sit flush against each side of the head of the bolt, it provides greater traction and grip. 12-pointed starts are easier to fit on the bolt, meaning you won’t waste a ton of time trying to set the socket just right. As with any tool you purchase, the build quality and overall sturdiness of the socket set you buy is an incredibly important consideration to take into account. If you can’t use your tools without doubting their integrity, then the tool is useless. Many socket sets also include some kind of warranty that protects it from wear, tear and damage. These warranties can vary greatly between manufacturer’s and models, so be sure you’re aware of your options if a warranty matters to you. For under $30, you can buy a budget socket set. These socket sets are simple and reliable, not offering much in the way of extra accessories. They get the job done without a ton of fuss. In the $30-$50 range, you can buy a socket set that fits the needs of most consumers. You can typically buy either deep or shallow socket sets in this price range with protective carrying cases, among other additional features. For more than $50, you can buy a premium socket set. You can typically purchase a pass through socket set in this price range, and you can expect to receive a larger number of sockets within these sets. The Stanley 92-839 is a sturdy, reliable and versatile socket set that will likely fill the need you have for purchasing a socket set. With a huge number of socket choices, along with additional features like Max-Drive for more torque and a sleek design, this socket set is an easy Top Pick. If you buy this set, you can also expect to receive a durable carrying case and incredible lifetime warranty, both of which only serve to add to the overall lifespan of the tool. Huge number of pieces. The Stanley 92-839 includes a whopping 99 pieces, making this socket set one of the largest sets on the market. Having more sockets in one place gives you more versatility in any number of different applications. While you may not need to use all these pieces for a single project, you can rest assured knowing you won’t go out and buy new pieces randomly, because you’ll likely have the piece you need in this set. Users are pleased with just how many different sockets they can use with this set. More torque. 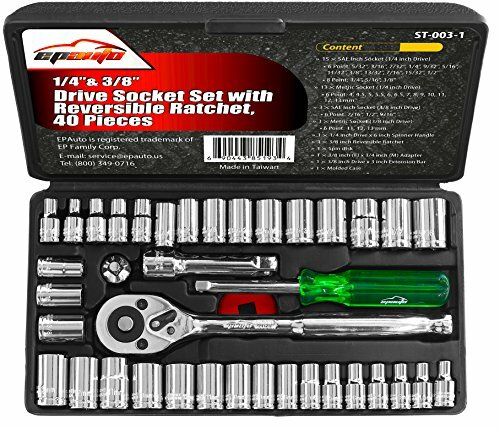 This socket set features a unique design feature that Stanley refers to as Max-Drive. According to the manufacturer, this provides up to 15% more torque than other socket sets, which many users can confirm. More torque means you can more easily remove bolts, even when they’ve been inserted too tight. Sturdy and sleek design. With laser etched markings and a sleek, black color, the Stanley 92-839 is a socket set that looks good. In fact, many users purchase this set initially based on looks. These sockets are also extra durable, featuring a corrosion resistant design that’s hard to pass up, especially if you work outside often. Included carrying case. The hard carrying case included with this socket set is a positive point for many users purchasing this socket set. The carrying has enough capacity to store all the pieces, along with the various attachments and accessories. This case also protects your socket set from the elements. Lifetime warranty. Stanley offers a lifetime warranty for this socket that’s hard to beat. If you have any problem at all with this socket set, Stanley will replace it for free, without requiring any kind of proof of purchase. This helps you get to work sooner, instead of wasting time trying to get a replacement product. Sockets fall out of case easily. 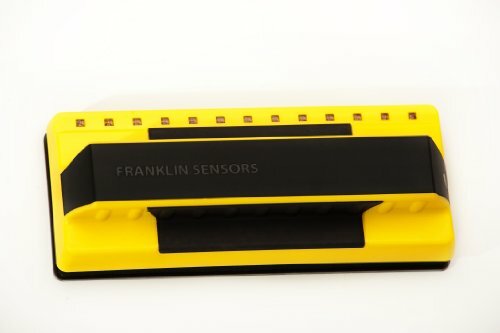 Many users report that the individual sockets have a hard time staying in their place within the carrying case, which can get annoying when opening and closing the case. The TEKTON 13101 is a socket set that features a good number of sockets, attachments and other accessories. Made from high-quality materials, and featuring both shallow and deep sockets, this socket set is a reliable choice for anyone looking for more versatility in the way they use their tools. You also get a heavy-duty storage and carrying case to hold all the pieces. These features and more make this socket set an easy choice for our Top Pick Runner-up. Good number of pieces. The TEKTON 13101 features a good number of pieces. With 45 different pieces, you can be sure to find an individual socket to fit most applications while using this socket set. While this isn’t the largest number of pieces, it certainly isn’t small number, either, meaning you’ll have greater versatility overall with this set. Shallow and deep sockets included. Something extra good about this socket set is the fact that it features both shallow and deep sockets. With this variety, you have more flexibility than many other socket sets on the market today. Built from high-quality materials. The TEKTON 13101 socket set is built from sturdy, high-quality chrome vanadium steel. The chrome-plated finish tops it off and makes the set look even better. Many users who buy this set say they are surprised at how well it lasts, even in tough situations. Sturdy storage case. The included storage case is durable and reliable, giving you an easier way to carry all the different sockets, attachments and other accessories in a single place. For one, this helps you keep track of all the pieces, but it also helps keep them in good condition, even when using them outside. Direction lever is switched too easily. Some users report that the direction lever that indicates which direction the ratchet twists is easily switched. This can happen in the middle of using the tool, causing problems mid-turn. The EPAuto ST-003-01 is a simple and reliable socket set that provides you a good number of pieces, which include sockets and accessories alike. These pieces also include both metric and SAE sizing. For the price and the included features, this socket set makes the perfect choice for home DIYers. 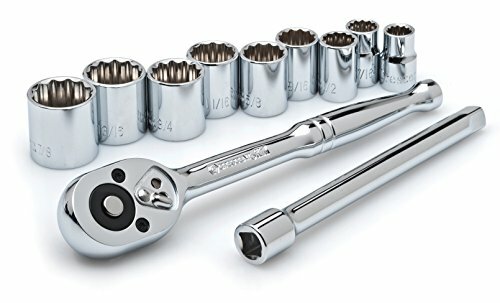 The features on this socket set are offered for an attractively low price, which is why this set is ReviewLab’s Best on a Budget choice. Includes metric and SAE sizes. This socket set includes both metric and SAE sockets sizes. This helps you use the set for a variety of different applications and for different purposes. 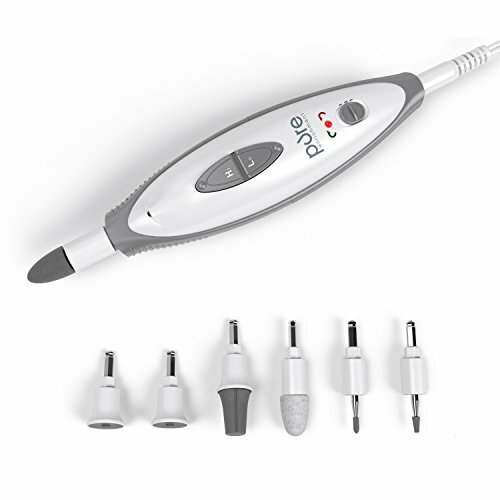 The EPAuto ST-003-01 set features 18 SAE sockets and 16 metric sockets. Users who purchased this set are pleased that both types of sizing are included. Plenty of different pieces. The EPAuto ST-003-01 socket set includes 40 separate pieces, includes a variety of different socket sets and various attachments and accessories. With all these pieces, you can use the socket set for different projects without worrying about needing to buy additional pieces to complete the project. Extra durable. 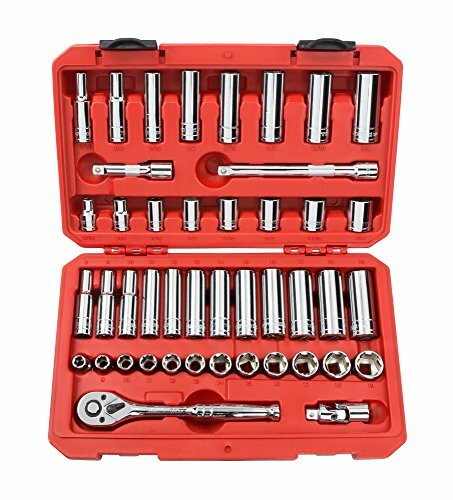 This socket set is made from hardened chrome vanadium steel alloy, which is extra durable and sturdy. The set is also chrome plated and mirror polished, which helps it prevent corrosion when exposed to the elements. Many users are happy with the overall quality of the socket set, especially for home applications. The case isn’t very sturdy. Many users report that the included carrying case isn’t as durable as they thought it would be. The Crescent CSWS6 is a socket set that is both durable and flexible. It meets A.N.S.I. load specifications and is made from extra-durable materials to ensure a long-lasting lifespan. 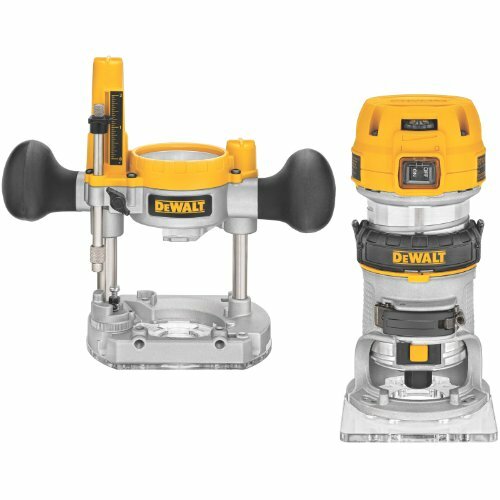 You can also remove bolts and other fasteners without worrying about rounding their edges with this set’s unique Surface Drive feature. This product is also sold at an incredibly low price, making it a great pick for our Best on a Budget Runner-up socket set. Meets A.N.S.I. load specifications. The Crescent CSWS6 meets or exceeds the A.N.S.I. load specifications. This means that this socket set is extra durable and will hold up even under tough work conditions. This also indicates that the product is well designed. Many users are pleased to know they are using a product that has been approved by a professional third party organization. Sturdy and high quality. Apart from meeting or exceeding the A.N.S.I. load specifications, this socket set is built from high-quality materials. Made of chrome vanadium steel and featuring a nickel chrome plating, the Crescent CSWS6 is sure to last for a long time, even through extended periods of use. Eliminates fastener rounding. Faster rounding takes place when the edges on the head of the bolt become smoothed out to the point of not being able to loosen the bolt. This socket set features a unique feature Crescent calls Surface Drive, which eliminates fastener rounding. Many users say they are pleased to find that this feature works as advertised. Crescent forever guarantee. The Crescent CSWS6 comes with an incredibly comprehensive lifetime warranty that covers the sockets, accessories and carrying case. If you run into any problems with this socket set, you can rest assured knowing it will be replaced under this warranty. Some users have needed to use this warranty and report having nothing but pleasant experiences taking advantage of this warranty. No handle on the case. The carrying case does not feature a handle for easier transportation. If you’re working in areas where the bolts are hard to reach, placed behind other components that are hard to move or in awkward positions, you might want to consider a deep socket set. These sets feature sockets that are longer than the standard set, which gives you greater versatility overall. Many of the deep socket sets on the market also include shallow sockets for more flexibility in the way you can use your tools. The GearWrench 80300P is a socket set that provides a good number of individual sockets and other accessories for your convenience. The sockets included in this set are both deep and standard sizes and exceed ASME torque performance standards for higher performance. You also get a narrow swing arc with this set that allows you to work in tighter areas. If you’re looking for a reliable and durable deep socket set, the GearWrench 80300P is a great, all-around choice that works well for both home DIYers and professionals. Plenty of individual pieces. 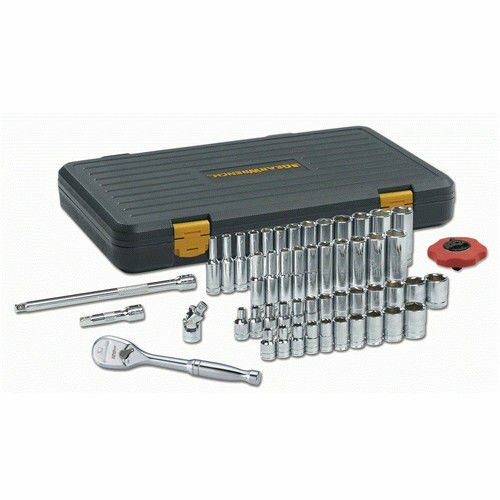 The GearWrench 80300P socket set includes 51 individual pieces, including a variety of individual sockets and other accessories like a thumbwheel ratchet, extensions and a universal joint. With these sockets and accessories, you can customize the way you use this socket set in a way that you prefer. This also helps it work for a variety of different projects and applications. Many users like having this many pieces available to them for the variety of projects they work on. Exceeds ASME torque performance standards. This socket set exceeds the standards set forth by the American Society of Mechanical Engineers, or ASME, for torquing. This means you can expect a high level of performance from the socket set without worrying about the set breaking under pressure. Incredibly narrow swing arc. Due to GearWrench’s proprietary Double-Stacked Prawl design, this socket set features an impressive 3-degree swing arc, which is narrower than many other sockets sets on the market. This provides 120 different positions in which you can use the sockets. It also means you can turn bolts in tight areas where you don’t have a lot of room to swing the actual ratchet wrench. Many users say they are especially appreciative of this feature, since it allows them to reach areas they were never able to reach before. Both deep and standard sockets included. The GearWrench 80300P includes both standard and deep sockets. This provides greater flexibility for you because you can use this socket set in a variety of different environments, without having to worry about getting stuck or not having enough reach. The case doesn’t have properly sized compartments. While this socket set does include a handy carrying case, the individual compartments for the different pieces aren’t molded to exact fits. According to many users, this usually ends up in loose pieces rolling around inside the case. Shallow socket sets allow you to access and work in areas with tight spaces. Just like deep socket sets, you may find that shallow socket sets also include some deep sockets for more versatility. These shallow sockets also tend to be lighter than other models, making it easier to use over extended periods of time. If you need to frequently reach bolts in tight spaces, you’ll definitely want to consider getting a shallow socket set. The TEKTON 4816 is a heavy-duty shallow socket set that works with impact tools for more intensive projects. With a good variety of available sockets built from high-quality materials, you can be sure to get the most out of this socket set. The set also includes a convenient carrying case that stores all your sockets safely in a central location. If you’re looking for a good shallow socket set that can be used with impact tools, look no further than the TEKTON 4816. Extremely heavy duty. The TEKTON 4816 socket set is made with high-strength chrome vanadium steel, making this an extremely heavy-duty choice. 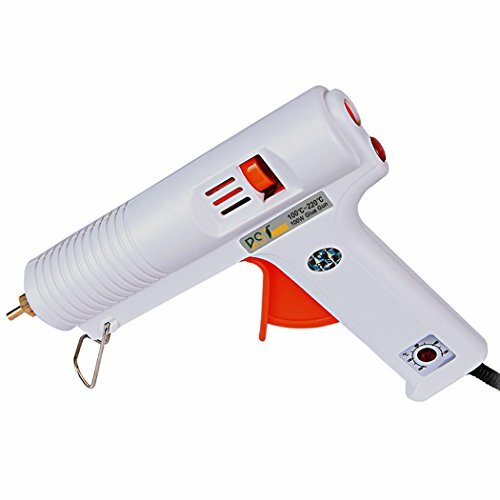 This means it works great in tough environments and makes a good choice for professionals who need their tools to hold up to harsh conditions. Many users are pleased with how well this socket set held up to the test of hard work. High-torque socket grips. The socket grips on this socket set feature the 6-point configuration. 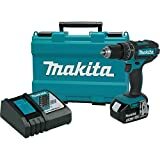 This is ideal for high-torque situations and doesn’t strip the fastener heads or damage the sockets themselves during use. Many users report seeing very little stripping and rounding while using these sockets. Works with impact tools. You can use the TEKTON 4816 socket set with your impact tools. 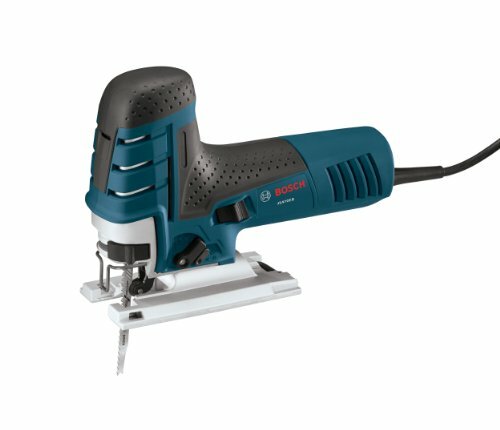 With its heavy-duty build and high-torque grips, you won’t have to worry about ruining any of the sockets during use with impact tools. Heavy duty carrying case included. You also get a handy carrying case with this socket set, which allows you to conveniently carry all the sockets with you in a central location. Many users who purchased this set report being extra pleased with the carrying case, as it is sturdy and durable. Laser etching wears off easily. This socket set identifies the size of the socket with laser etched markings. However, many users report that this laser etching wears away quickly since this is a shallow socket set. 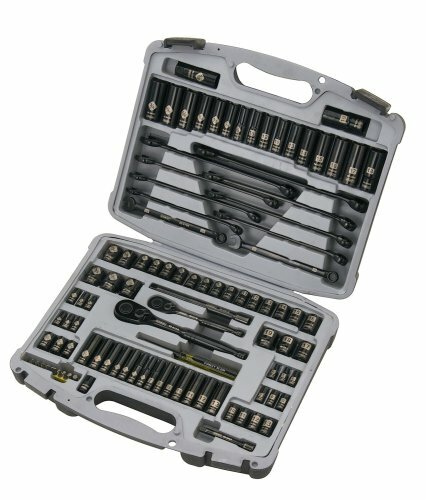 A pass-through socket set is a unique choice that gives you even greater flexibility than deep socket sets. These tools feature hollow sockets and ratchet heads which allows the bolts to pass entirely through the socket. This helps you reach even deeper than deep socket sets and gives you a much greater level of flexibility in a variety of different applications. This innovative design is becoming more and more popular in the professional world. 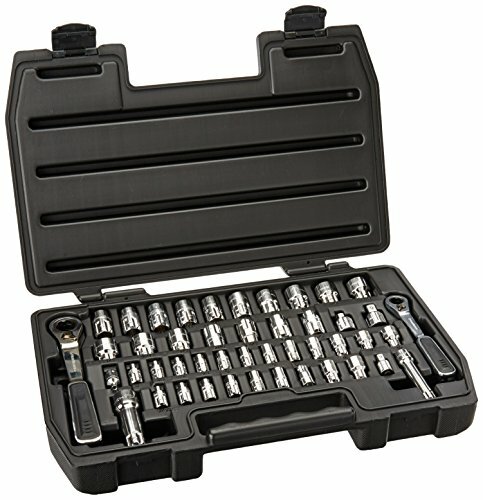 The GearWrench 8946 is a unique socket set that features an incredibly useful pass-through configuration which allows you to reach deeper areas with ease. You also receive a good number of individual pieces and accessories in this socket set, which are all contained in a sturdy, convenient carrying case. If you’re looking for a socket set that can reach deeper than traditional deep socket sets, you should definitely consider the GearWrench 8946. Unique pass-through configuration. The biggest selling point to the GearWrench 8946 is its unique, pass-through configuration. With this type of configuration, you can loosen fasteners that are extra-long. As you do, the fastener just passes through the hollow socket. This gives you greater versatility overall in the ways you can use this socket set. Many users purchase this set for the pass-through feature alone. Wide variety of individual pieces. This socket set includes a wide variety of individual pieces. With 46 individual pieces, you can use this socket set in multiple different scenarios and for a good variety of different projects. Users are pleased with how many pieces this set features, even if they don’t constantly use all the pieces available in the set. Thinner than traditional socket sets. The GearWrench 8946 is 50% thinner than tradition ratchet systems, which allows you to reach tighter places with greater ease. Many users appreciate this thinness, and have used it to their advantage many times over. 5-degree swing arc. The length you need to swing the tool in order to achieve any kind of movement is really important, especially if you’re working in tight spaces. With a 5-degree swing arc, this socket doesn’t need as much room to swing fully. This gives you more room to work in tighter spaces. Well-designed, sturdy carrying case. 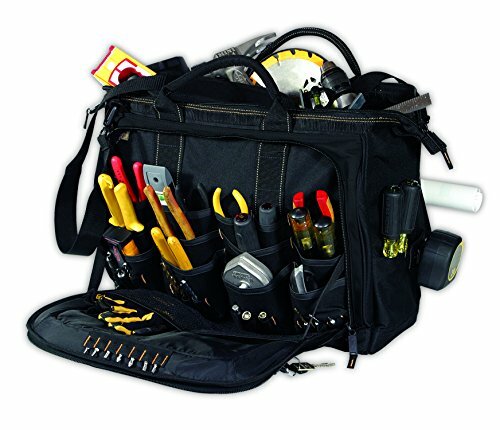 The carrying case is a feature that many users really like with this socket set. It features enough space to carry all 46 pieces in a convenient, protected manner. You can also remove the top portion of the case so it can sit open and flat inside a tool chest. Sizes are hard to read. Some users report that the size identifying marks on the sockets are too small and too hard to read. The Crescent CX6PT20 is a reliable and sleek socket set that features a super-convenient pass-through design that allows you to eliminate the need for both standard and deep sockets in your tool bag. 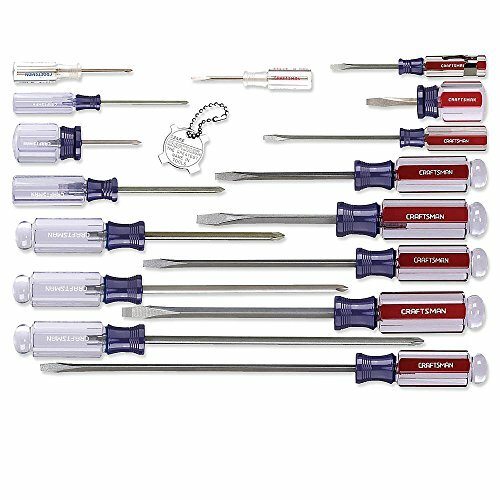 This set also features a unique socket grip configuration that allows you to work with six different types of fasteners. This pass-through socket set is a great addition to anyone’s tool set, whether you are a hobbyist or professional. Unique socket grip configuration. The Crescent CX6PT20 is part of the manufacturer’s X6 line of socket sets, which features an incredibly unique and capable socket grip configuration. This configuration allows you to work with six different faster types: hex, square, 12-point, E-torx, partially rounded hex and spline. Many users are especially pleased with the versatility this configuration provides. Versatile pass-through design. The unique pass-through design featured on this socket set gives you more flexibility in what environments you can work in and eliminates the need for carrying around deep and standard-sized sockets. Many users buy this socket set solely for the pass-through design, as it gives them more flexibility overall. Sleek, durable design. The Crescent CX6PT20 features a sleek black design that is appealing to many users who purchased this socket set. It’s also made from durable materials, which many users report add to the overall lifespan of the product. Laser-etched size markings. With laser-etched size markings, you can easily see what socket size you’re using at a glance. These markings are super convenient and add speed and efficiency to the way you use the socket set in your projects. No carrying case. This socket set does not include a carrying case.